especially the rear LCA. I wish I had this one when I started. I would replace the odd-angled 427 rear suspension with that of the 289.
does anybody know the original designer of the 427 rear suspension? I wonder what the demands to that design were in the 60s. I suspect that the 427 RS was designed by the same person who did the GT40 rear suspension. The layouts are quite similar, within the limits of the basic chassis design. The angle is there for anti-squat. The Shelby springs are unique to the Shelby uprights. Shelby added eccentrics to the uprights so camber could be adjusted, so the springs are shorter than an original spring. As shipped, all the 289 Shelby's need to have the springs re-arched. My plan is to have a local spring shop make up a set of springs to the original drawings, then arch them to get the correct right height. Its a pain, but I don't know any other way to do it. The CSX7000 series cars use Afco shocks, and the CSX8000 series cars use Spax shocks. To have a beer with him, show up at a SAAC national, he appears at quite a few of them. As a matter of fact, I wanted to ask him why the 427 used a welded on rear subframe as opposed to a full length frame rail (as a scratch builder here at CC has done). I just hope I can remember to ask at the next open floor at the nationals! I think it has to do with optimal cahssis mounting points, as I do recall that the rear arms on the 427 were a ' best compromise' because the original computer design had the forward points in the drivers arse. Not bad in a straight line, but I sure it hurt like he// over a bump!! I learned a lot about this rear suspension from my books, Morris' build-up and input from R.Hudkins and of course Strictly P.
But my two buddies at chassis design in Germany say there is more to that rear suspension, which is actually amazing - if correct. 1. the 40odd degree mounting anlge of the track rod is not critical, however the center of the mount is. the distance from the center of the chassis and the heigth above ground. the track rod angle dictates how much anti-squat you've got. pointing at the center of gravity of the car (CG), actually lower than that, I guess 20% anti-squat. the saying is, that those track rods would have ended up in the drivers back if mounted at full length. a less heavy car having a lower CG, in theory, could have those track rod pointing at another angle. people used to set up for acceleration (4-link in a drag cars) know what I am talking about. 2. the 12-odd degree angle of the LCA chassis mount is needed to slide the bolt in, and maybe to give the rubber bush a pre-twist? I don't know. this rear frame is needed to have the LCA mount as far to the center of the chassis as possible to get a decent camber curve, and maybe to replace it easily after an accident. the RC should be the same distance on the rear axle to the CG (of the rear axle) as the front RC to the front axle's CG. 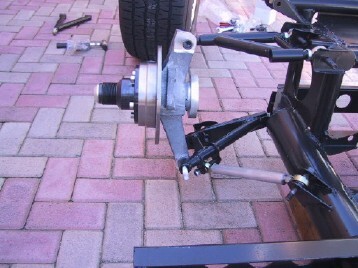 RC front: 5.5", RC rear 2 5/8" above ground. CG, I don't know, I estimate camshaft height in front, diff input shaft in the rear. the control arm mount of the track rod pointing down supports that movement. has this suspension originally been designed for a street car on skinny 205 tires, or for a racing car with little suspension movement and 10" tires? still anti-squat is also a good thing for racing, if the suspension is not binding. the original layout causes the outward wheel to toe-in in ROLL (bump) and the inward wheel to toe-out. total toe is still "IN" but more, helping the car in the corner - and out of the corner once you push the pedal down. toe-ing less IN, but not out! that whole movement is also affected by the 3-odd degree of the UCA. I heard a current Dodge Viper's rear suspension follows the same idea. which is turn, would make the 427 rear suspension a masterpiece, and worthwhile to copy it. It is quite comlex! Interesting to see that the 2004-5 Ford Explorers use the same Cobra derived rear suspension. The uprites look like they will fit a Cobra, with little modification. Go to your local Ford dealer's parts dpt. they can get you an xploded view. (I have one, I'll get "Werks to post) While your there you can look under an Explorer. I didn't measure one ,but it looks pretty damed close. I may have found the front uprites too, but won't know untill I get it on a surface plate to measure. Just think, real Cobra parts, still being made. Mr Bruce, good work keep us posted. I wonder if the Explorer uprights would fit the T-bird IRS CV axles? Hmmmmmm.......... the wheels are turning. If someone gets a copy of the exploded drawings and dimensions, post it here , could you? Heck of a price at opening...lets see what she does at the dinner bell! So who is this person? Anybody know? I have a guess but would rather not look more foolish than necessary. mine are $260 per pair from 356-T6, x-rayed, unmachined plus shipping (from south-africa). I fitted FORD Granada in one set, could provide "as cast" measurements that you can see how much meat there is. anyway, at the moment I can offer none, or 10 meaning I would have to get a new batch cast, which will not happen before october after I come back from Germany. I see this thread was started some time ago, but hope you are still reading posts. I'm planning a 289 project and need to get the chassis modelled and drawn, or find someone who can supply/sell me plans. I've looked at your gallery, but can't find the drawings referred to. Have you removed them now? Hey lurker good to see you're around still. They always go best right before they blow, what ET did ya run? John check for a free download of e-draw and that will let you open CAD and even 3D files like Solidworks ProE etc.